Beurre Blanc is a classic French sauce that is a hot emulsion of butter and wine, often with the addition of an acid (traditionally white wine vinegar, but you could use citrus juice). It is most often served over poached or grilled seafood like pink salmon fillets, halibut fillets, and halibut cheeks. Note: As a hot emulsion, Beurre Blanc is a member of a persnickety family of sauces that includes the dreaded hollandaise (scourge of culinary students everywhere). Careful heat control is very important. While Beurre Blanc is not nearly as difficult as hollandaise, you still will want to keep a very close eye on it the first few times you make it, and be ready with extra ingredients in case something goes wrong. 1. Cut your butter into small cubes and return it to the fridge. It is essential that the butter be well chilled when it goes into the pan. 2. Pour the white wine and your acid ingredient into a sauce pan and add your finely diced shallots. Bring the liquid to a simmer and reduce it by two-thirds. Don’t worry about the small volume of liquid remaining, there’s a lot of water in butter. What you’re doing right now is concentrating the flavor of your other ingredients. 3. 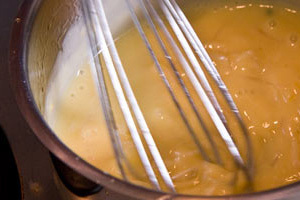 Reduce the heat to low and slowly begin to add the butter while whisking constantly. You want the butter to melt into the sauce, without the sauce boiling. If you’re using an electric stove or your gas burner is running hot, you may have to remove the pan from the heat entirely in order to control the heat. This is the tricky part, and you may have to do it once or twice in order to keep the sauce from falling apart. 4. Once all the butter is incorporated and the sauce is smooth and consistent, taste it and add salt as needed. Strain the shallots out of the sauce if you want a crisp presentation, or leave them in for something more rustic. Your beurre blanc can be made ahead of time, although you will have to keep an eye on it. Try to keep it warm, but not hot, and remember to whisk it every now and then to keep the ingredients together. Broken sauces can occasionally be saved, but often with a hot emulsion sauce you simply have to start over and be more careful next time. Don’t worry, it sounds more tricky and frustrating than it is, and once you get the hang of it you will rarely lose a sauce. Try adding a small amount of water and whisking vigorously while either heating it up (if you think it’s too cold) or putting your pan on some ice (if you think it’s too hot). If you’re lucky you may be able to regain your emulsion. For an example of a recipe using a modified beurre blanc, visit our Baked Sockeye Salmon with Preserved Lemon Beurre Blanc recipe.